Unknown tagged Hawksbill Sea Turtle (Eretmochelys imbricata) was caught by fishermen in Seruway Sub-district, District of Aceh Tamiang, Indonesia, on 23rd of January 2012. This turtle was caught by a fishing net at nearby of Pusong Cium, a beach where Painted Terrapin nest every year. Mustaqim (the local fishermen who caught this turtle) brought it to his house. Two days later, on 25 of January, he give this information to Datuk Laksamana, leader of a traditional institution for sea management (called Panglima Laot in Aceh) in Seruway. Mustaqim did not know what species it was. After receiving a short message service (SMS) from Mustaqim, Datuk Laksamana who is our partner in the field. Imparted the information that a Painted Terrapin (Batagur borneoensis) was caught by fishermen in Pusong Cium. If any of Painted Terrapin are caught by fishermen, we always ask local fishermen to report to Laksamana and us. We can collect data needed for monitoring the population in the wild. Datuk Laksamana asked Mustaqim to bring the turtle to Laksamana’s house. Then, Joko and Yusriono went there to identify the species and collect data needed. 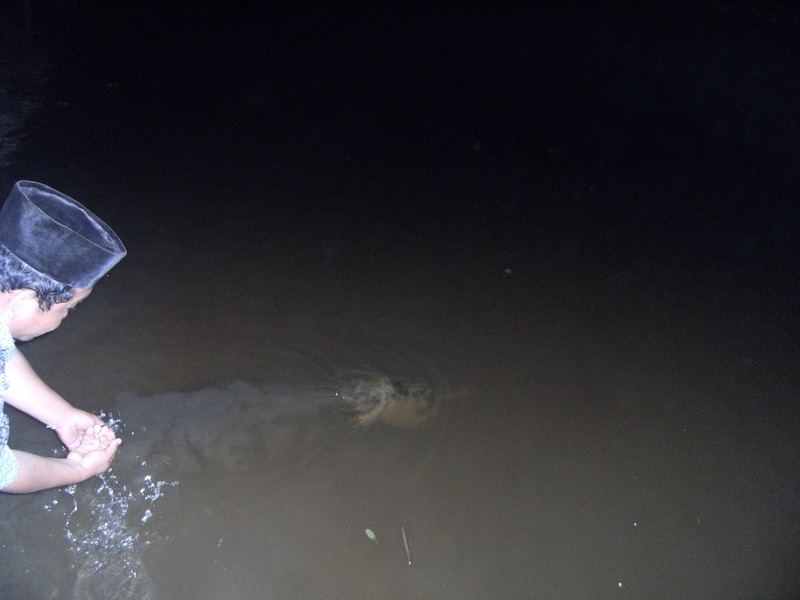 After this we were aware that is not Batagur borneoensis, but Eretmochelys imbricata. 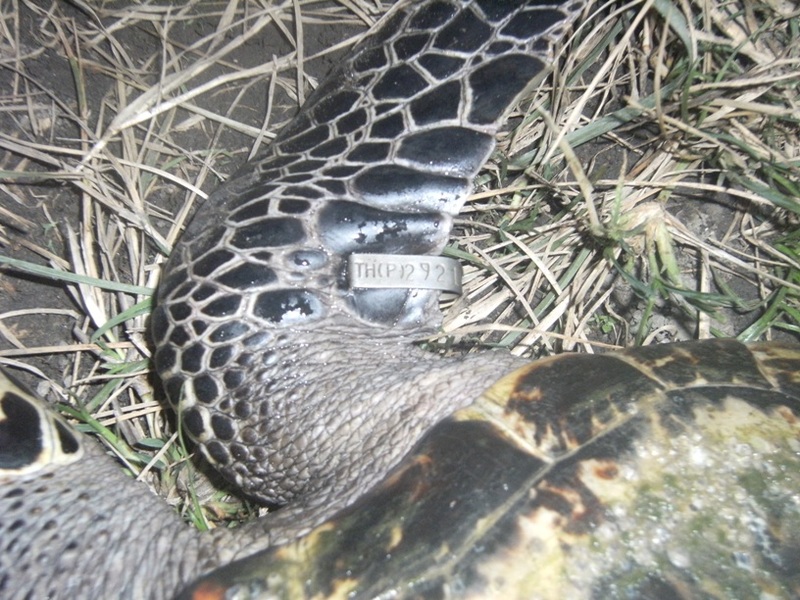 We were also shocked by the fact that this turtle had been tagged with ID number TH(P) 2921. We still do not know the origin of this turtle. Then we measured the carapace, weight, and health. 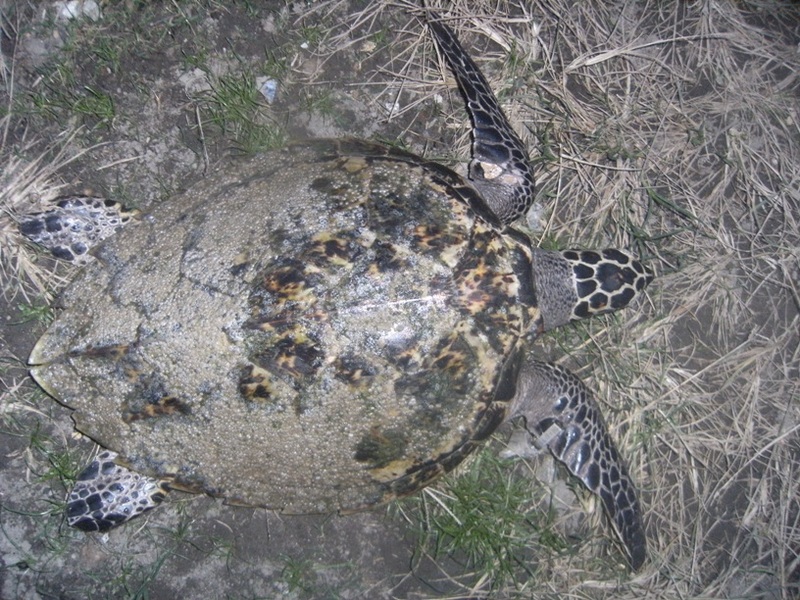 This hawksbill weighs 8 kg, 38 cm in length and 34 cm in carapace width. We found no injures. We told the people involved that the species is Hawksbill Sea Turtle, not Painted Terrapin and mentioned that the species is protected by law. It is prohibited to keep and sell the species. 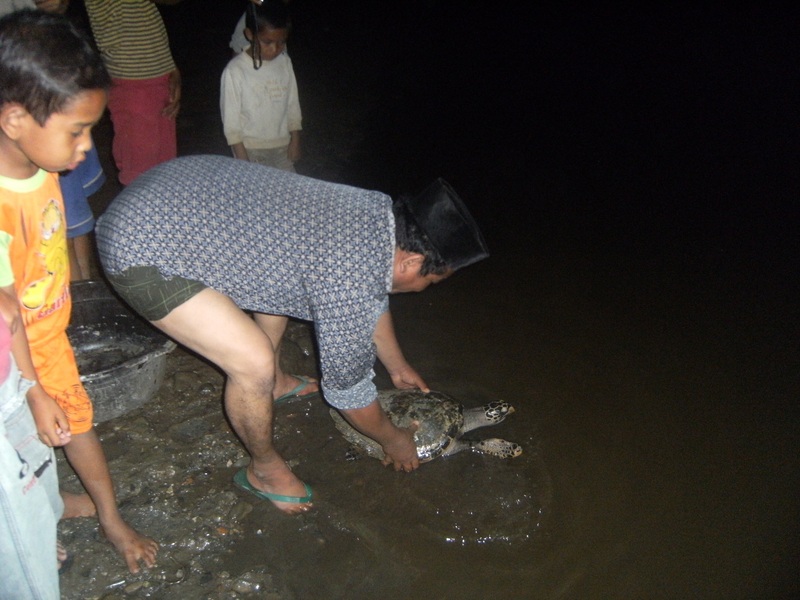 After that, watched by local people, we asked Datuk Laksamana to release the turtle.